I wrote an article (below, after the Daily Mail article) about the possible reasons for Bristol Palin’s buying a house in Arizona when there was considerable speculation as to why she had done,what a first sight seemed a puzzling move .Subsequent events seem to have supported my original premise that this might be an aspect of Sarah’s 2012 run. The made up story, published today in The Daily Mail/National Enquirer, that Bristol “banned Sarah from her house” was shot down in flames instantly by a commenter who advised that Sarah had done her Greta/Fox interview from a local park in Maricopa. Here is the original article which explains why Arizona is the perfect base for Sarah’s 2012 run with electoral College map. If anything,subsequent events have confirmed the main poin tof the article and points even further to Sarah making a 2012 run from that base. Speculation abounds as to why Bristol Palin has bought a 5-bedroom house in Maricopa Arizona. Whether or not Bristol moves to Arizona to go to ASU is a sidelight to the overarching reason i.e. Arizona is the perfect base for Sarah Palin to conduct her 2012 presidential campaign from. Sarah Palin clearly found that McCain’s 2008 base was ideal as a hub and the electoral map for 2012 clearly dictates the same reasoning would apply. Obviously, given the enormous distances involved, Alaska would be to challenging, time-wise at least, to run a campaign from.An examination of the electoral map (below) route to victory for Palin makes everything clear. 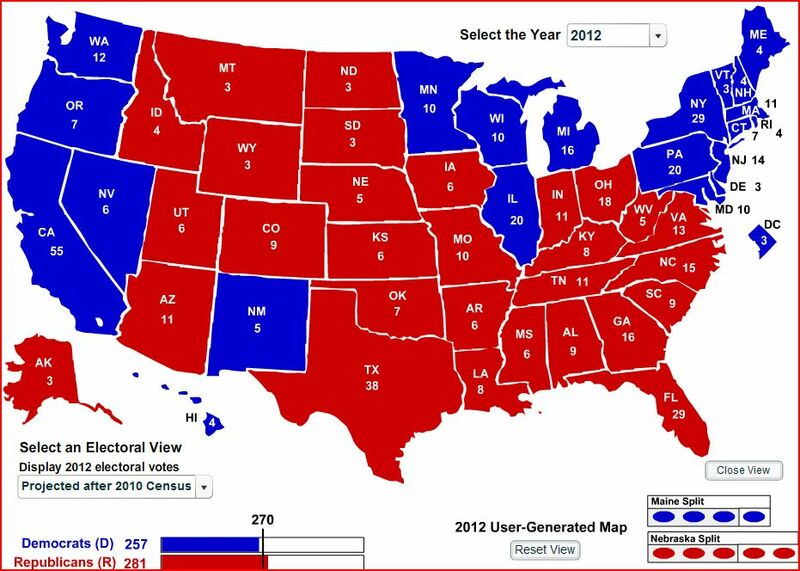 If on election night Florida goes for Obama, then Republican supporters might as well turn off the television, as there is no combination of states, subsequent to the loss of Florida, which can give the Republicans the 270 electoral votes needed for victory. This implies that Palin’s VP choice should be a Catholic with experience cred’s such as Rudy Giuliani, or an Hispanic Catholic from Florida i.e. Marco Rubio. Both would appeal to the Hispanic voting block in Florida (Rubio being the obvious choice based purely on pragmatism) and in the vital southwest states. Assuming Florida goes for the G.O.P. then North Carolina and Indiana should come back into the fold. Virginia is crucial as 270 EV’s can’t be reached without it unless the Hispanic vote in Nevada or New Mexico can be won over to some degree. Given this scenario the absolute key states start to unfold. It is obvious that next to zero time and resources need be spent in the Eastern or Western states or in the safe states of the South and Mid-West. This is an excellent situation as it allows for the maximum spend in time, advertizing and supporters energy where it matters most. Once again Palin confounds her critics who are dumbfounded as to why Bristol has purchased a house in Arizona. Let them continue to write her off as having no electoral skills, they will be utterly undone in November 2012. This entry was posted on April 28, 2011 at 6:24 PM	and is filed under Uncategorized. You can follow any responses to this entry through the RSS 2.0 feed. You can leave a response, or trackback from your own site.